Welcome to March! 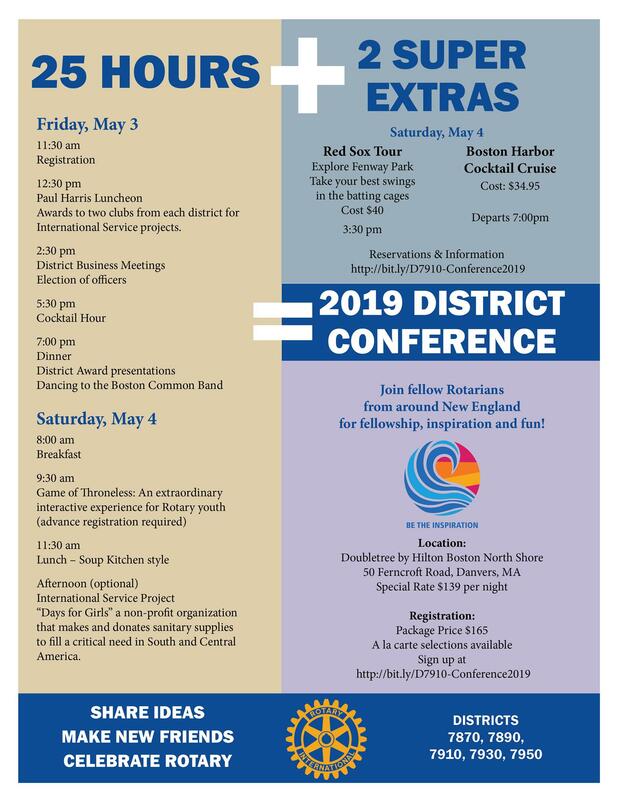 I am keeping this month’s message short to highlight two all district events that every Rotarian should attend, and the club planning guide. The two events are the District Training Assembly and the District Conference. Registration for both is now open so please register quickly. 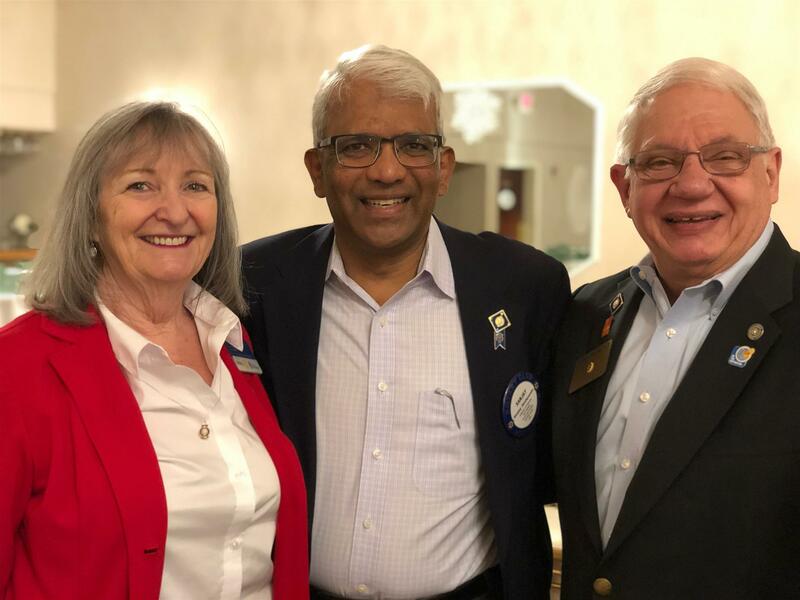 There is much more news that could be highlighted in this month’s edition, and all of those great stories are on our District Website at Rotary7910.org. 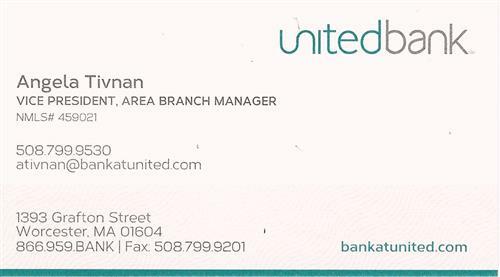 I urge everyone to check into the District website on a regular basis to get the most up to date stories of interest to our clubs. Of course, we are also highlighting our collective experience on social media: Facebook (click here) and Instagram (click here). Like, follow, and share!! 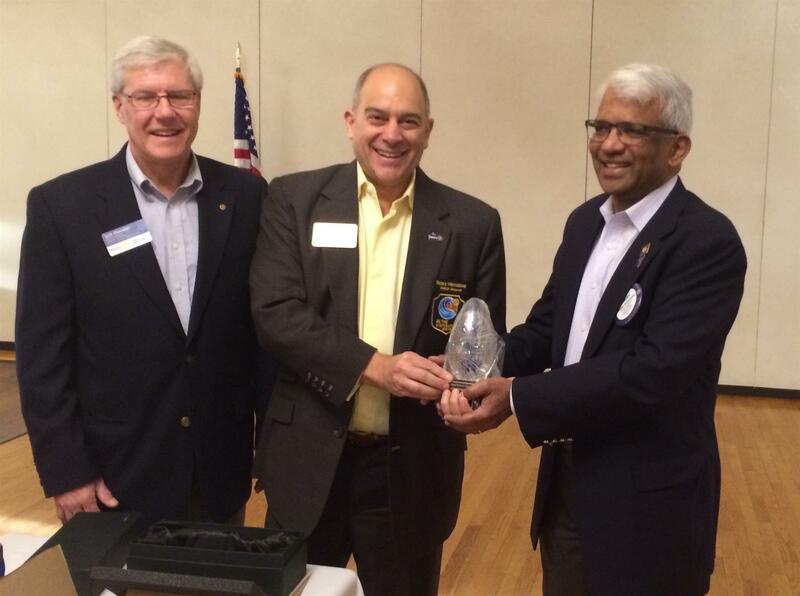 What better way to welcome new members to the family of Rotary. It’s time again to pull your team together and register for the District Training Assembly. Once a year we take a morning to share ideas, fellowship and hopefully a few laughs. This year we have a fantastic program in place for everyone. 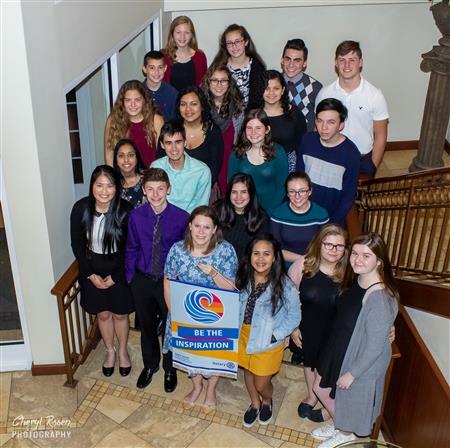 The Assembly is a great way to get all of your club members, officers and committee chairs networking, engaged and aware of what’s happening with the clubs in our District. 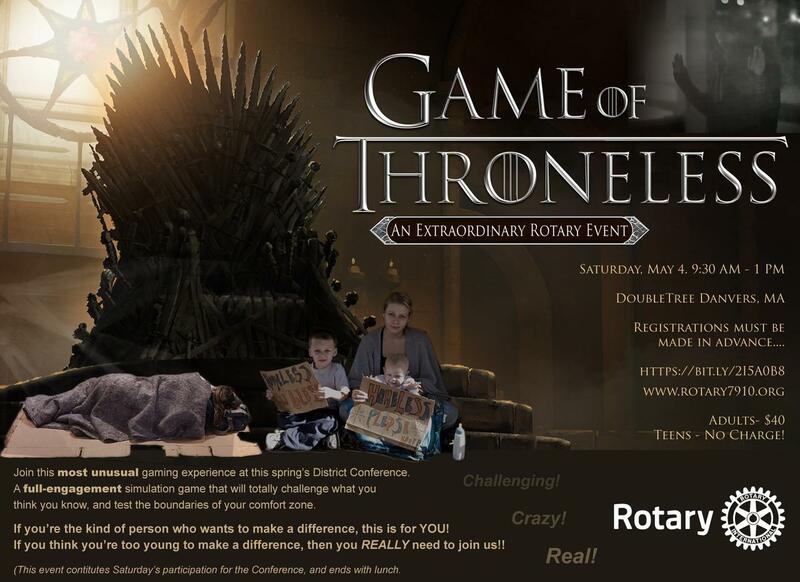 This District Wide training event is for ALL Rotarians. 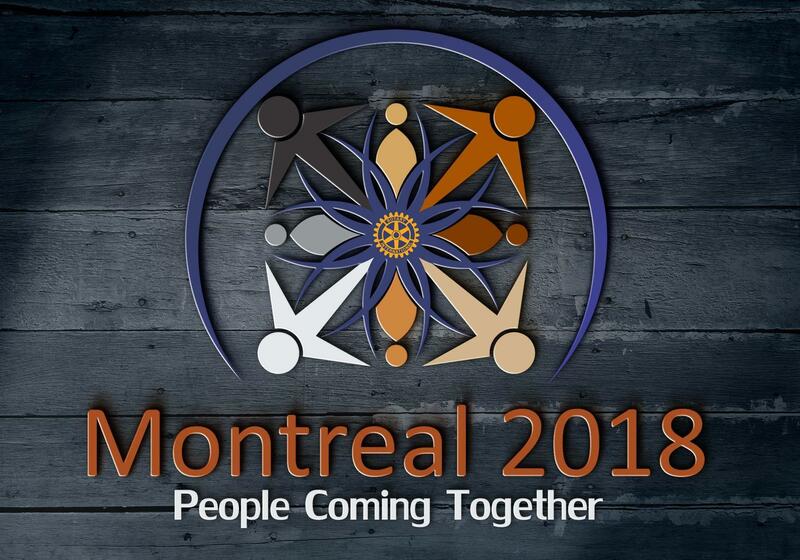 Whether you are a new member, committee chair, club officer, or veteran Rotarian there is something at the Assembly for you! Learn more about how you can help enhance your club’s membership experience, public image and social media efforts, and implement new ideas for engaging service projects. Learn about next year’s grants scoring rubric to obtain a District Grant. 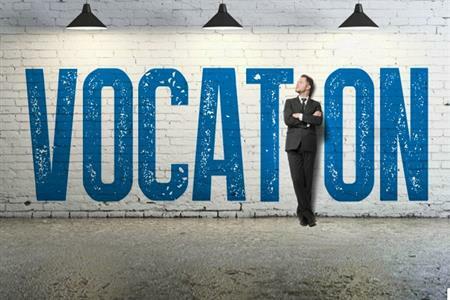 Club Secretaries and Treasurers have programs targeted to make their jobs easier. If your club is not yet qualified to apply for foundation grants, a member of your club will be invited to attend the foundation qualification seminar. Running concurrently with the Assembly is our second New Member Orientation program. Please send as many of your members as you can to the Assembly, and your new members to the Orientation program. The event is only a few weeks away, so please register now. 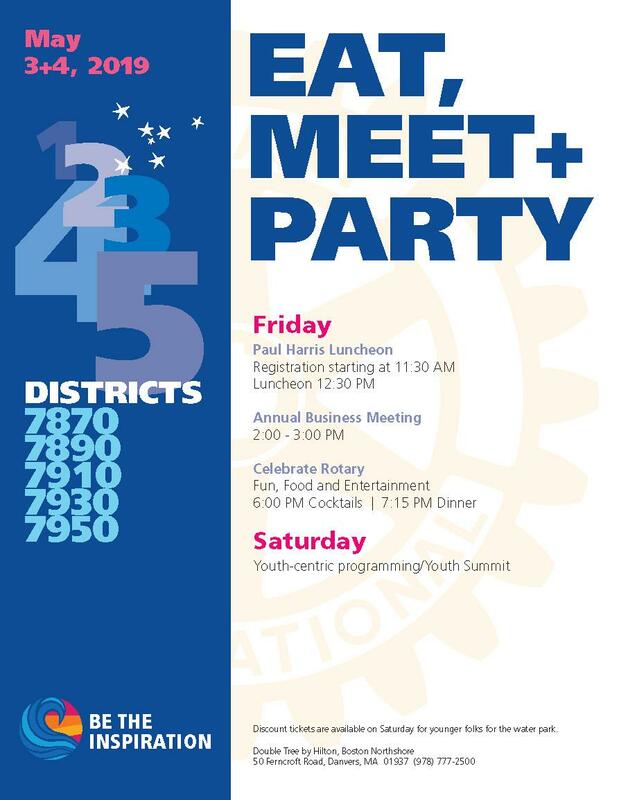 We have a fantastic event being planned for all Rotarians from five (5) Rotary districts. That is over 280 clubs covering the entirety of Massachusetts and Rhode Island, plus northern Connecticut, Southern Vermont and Southern New Hampshire. 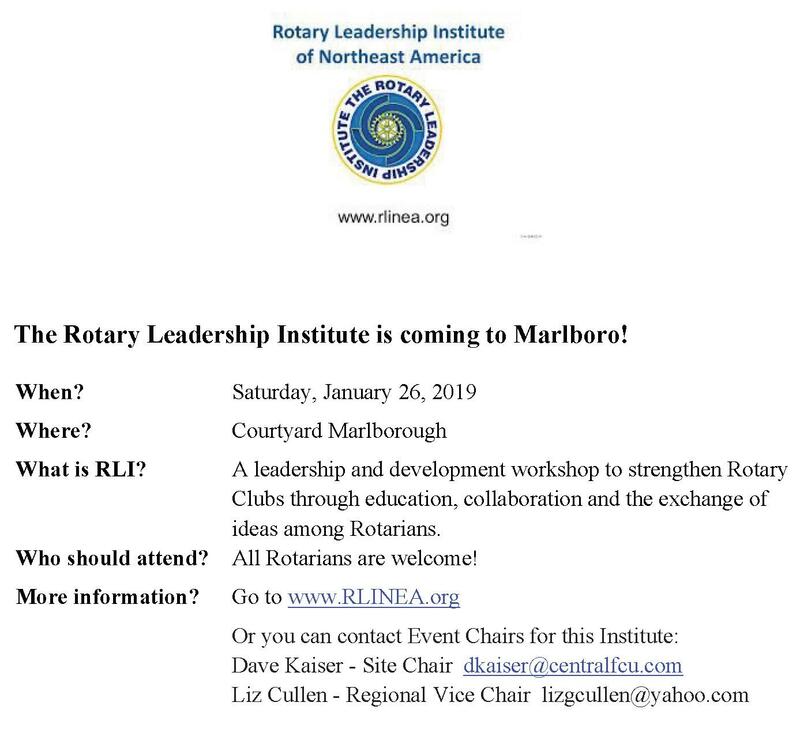 If you have ever been to PETS (the Presidents-elect Training Seminar) you know the energy and excitement that can happen when you get Rotarians from all over New England to train. Imagine what it will be when we all come together to celebrate! 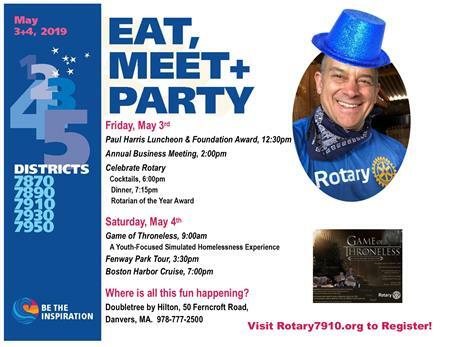 The Conference starts on Friday May 3, 2019 with a Paul Harris Luncheon celebrating the Rotary Foundation. Many clubs have already indicated plans to cancel their weekly meeting and hold it at the Conference. 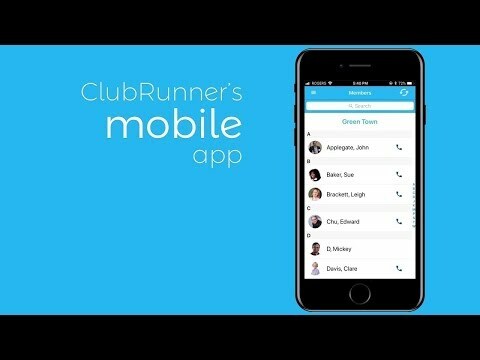 Consider asking your club to do the same! Following lunch, we will have our District’s annual business meeting where delegates from your club should attend. The evening’s activities start with cocktails and continue to the huge dinner dance gala celebration of everything Rotary. The Boston Common Band – one of the best entertainment groups for private functions in the area – will be there to entertain and keep us dancing until after midnight! Of course with this being a District Conference, there is a likelihood that some of you will be up much later . . .
Saturday begins with a brunch. 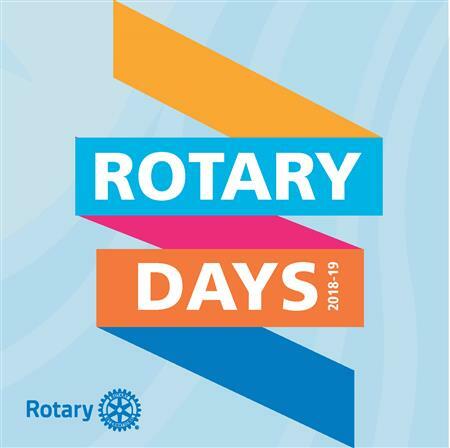 Young Rotarians – Interact, Essex exchange students, and RYLANs – will present to us their morning activities and how our Rotaractors helped mentor them! 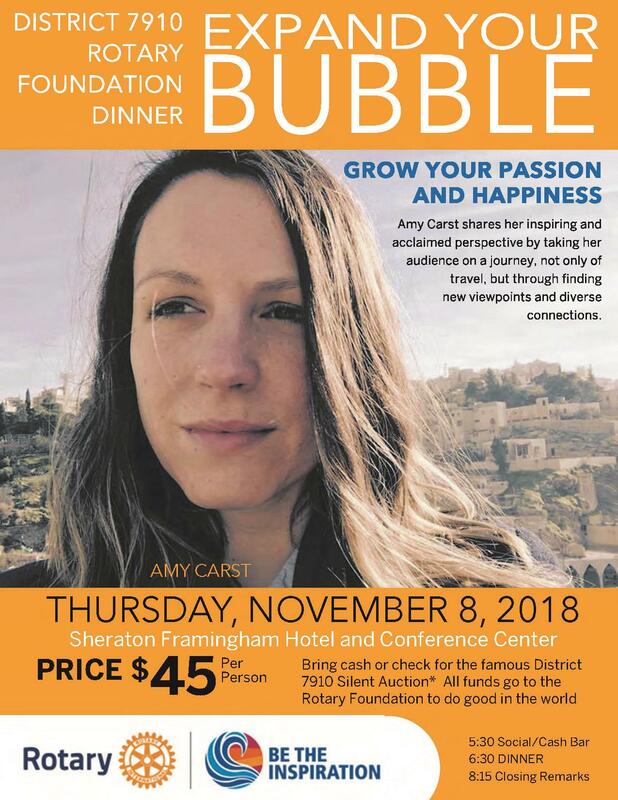 If you are still up for more, there are optional activities after brunch and the youth summit, such as the hotel’s indoor waterpark, a Fenway Park tour, Fenway Park batting practice, and a cocktail cruise on Boston Harbor. 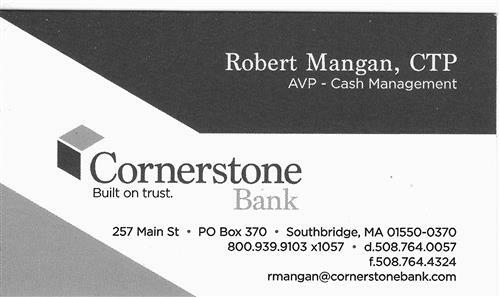 The conference is conveniently located at the Ferncroft Doubltree Hotel in Danvers, Massachusetts. 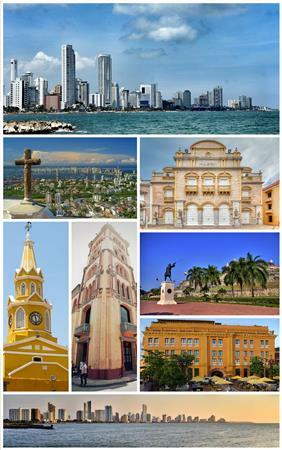 There is package pricing and la carte options available. <CLICK HERE TO REGISTER FOR THE CONFERENCE> . 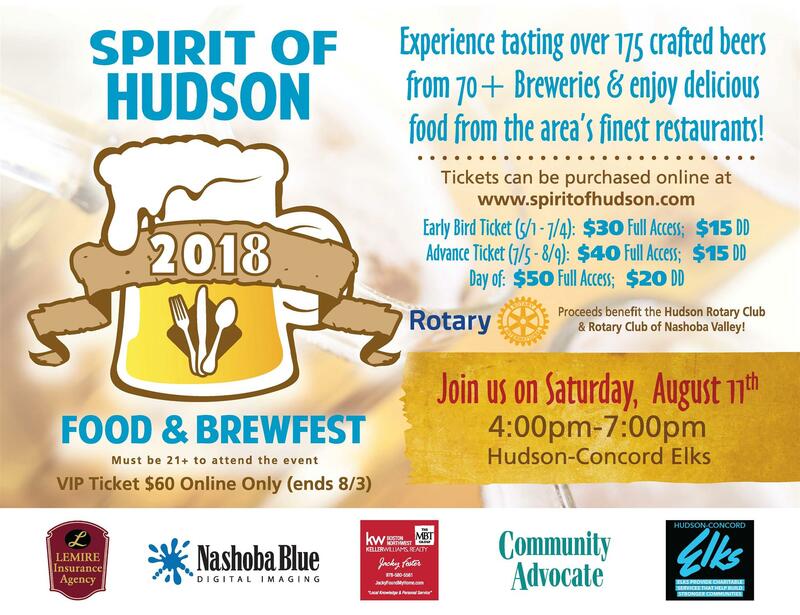 In addition to training and celebrating, there is one more item as we hit the home stretch of the Rotary Year. That one item is our Club Planning Guide. This guide was passed out to the Club Presidents at PETS last year to help them plan your club’s year. It has been posted on the website and your assistant governors have been telling your club about it. Now that your club’s next leaders have been trained at PETS, it is important that you enlist them to help accomplish your club’s goals and finish the year strong, so your club can start even stronger come July 1. I am off to Guatemala with Rotarians from around the District to help reduce respiratory illness in the rural areas around Panajachel by installing fuel efficient and vented stoves. 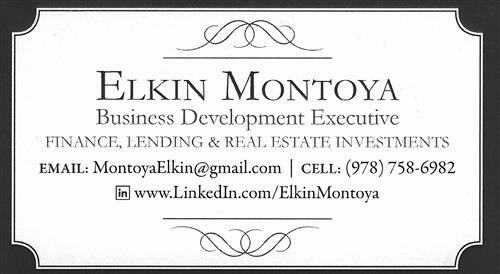 Follow us on social media for the latest updates on the project. 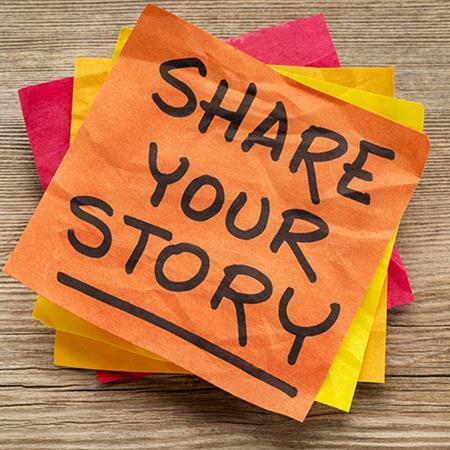 Remember, please send in your stories. Please send flyers for your events. 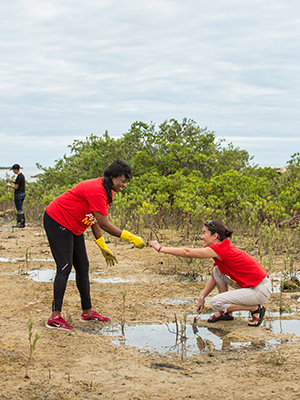 Please remember to invite our Rotaractors to help on your service projects! Have a great month! 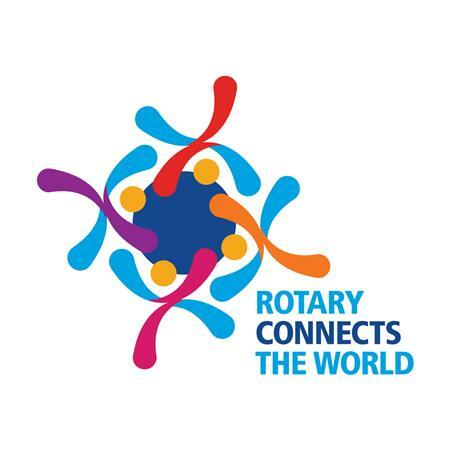 My own early exposure to Rotary was through my Dad’s Rotary Club. It was a large lunch club. Consum-er patterns were different then. I remember listening to baseball games on the radio with my Dad. Now, while many still attend games or watch on TV, a large segment of sports enthusiasts of all types consume sports via social media, on highlights shows, or streaming over the internet. Back then TV was three major networks and some UHF channels, now it’s hundreds of channels and numerous ways to view offerings from TV’s to computers to handheld devices. 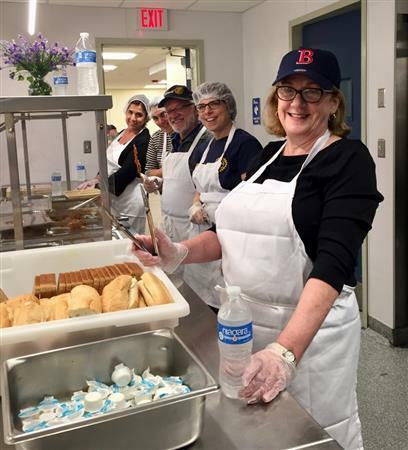 For the second year, Rotary District 7910 is preparing to provide meal service for a week to veterans at the New England Center and Home for Veterans (NECHV) located near Government Center in Boston. The Week of Rotary covers 10 meal service shifts spread out between Monday May 27th and May 31st in honor of Memorial Day. 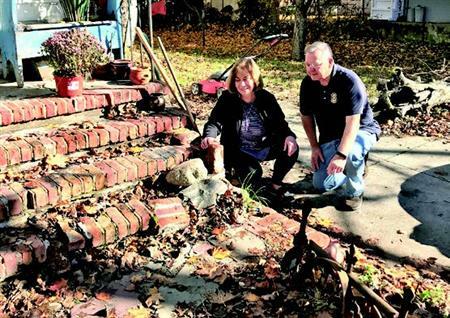 Fifteen Rotary clubs participated in this program last year and found great meaning and inspiration in this service opportunity. By proudly partnering with NECHV, clubs are helping to ensure that veterans of every era have the resources they need to live with dignity and independence. 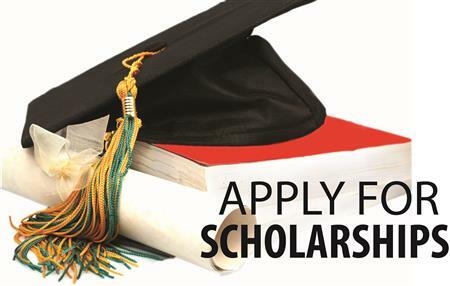 Do you know anyone who might be a candidate for our D7910 Morley Scholarship? 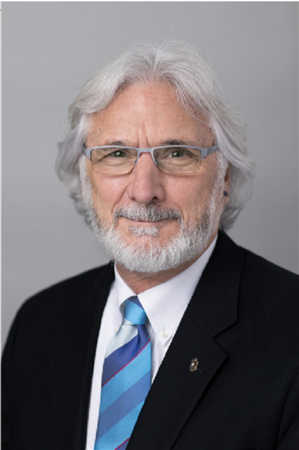 Rotary District 7910 is pleased to announce that Global Grant applications are now being accepted for the David & Eleanor Morley Endowed Global Grant Scholarship, now open from February 1st through March 31, 2019. This $35,000 one year scholarship is open to any resident of the 117 cities and towns represented by District 7910 who is planning on graduate study abroad. 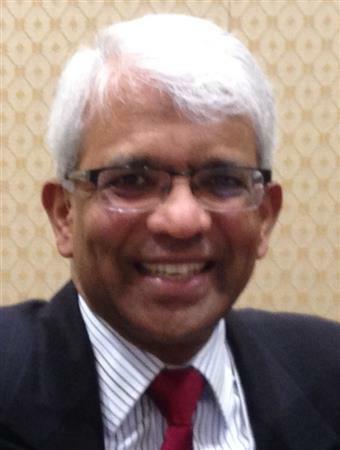 Unique to D7910, the Morley Scholarship was established by a generous WPI graduate and Rotarian. It is managed by The Rotary Foundation Permanent Fund in cooperation with the D7910 Rotary Foundation Committee (Scholarship). The window of application of two months will be followed by an interview, and the announcement of one qualified candidate. Read more for the qualifications and application information. We have lots of information in this Newsletter! I would love to say it is because we have so much going on in the District (which we do), but also time demands did not allow me to get this letter out sooner (oops!). When I put these together, I have no idea who, if anyone, will read the letter, but, apparently based on the emails I received asking where is the February newsletter, more than just a few of you read this! Before I get into the substance of this month's message, I just want to encourage EVERYONE to send me articles and pictures on what your club is doing. You work hard to give back and your club should get some recognition. 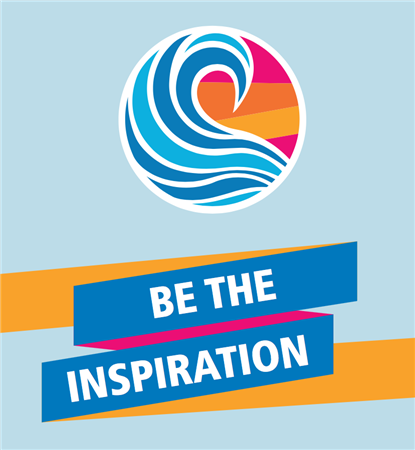 More importantly, what you do inspires others, so together, let's Be The Inspiration and share our stories! Who Wrote the Manual of Procedure? 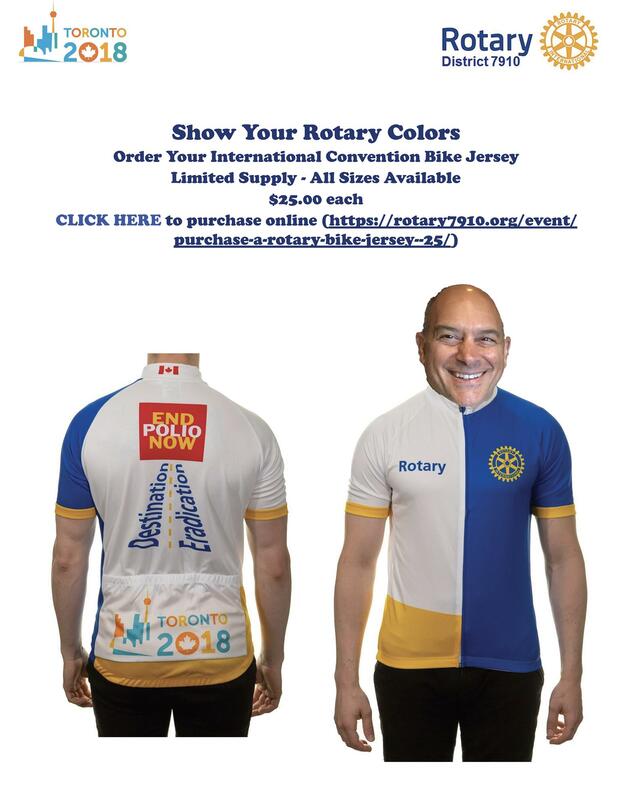 So you joined rotary? You had a fireside chat or a breakfast with an experienced club member. He or she told you what you needed to know to function as a good club member. 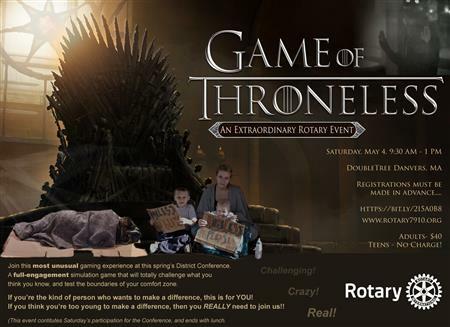 Needless to say you did not learn everything about rotary in that hour! Or, maybe not!! 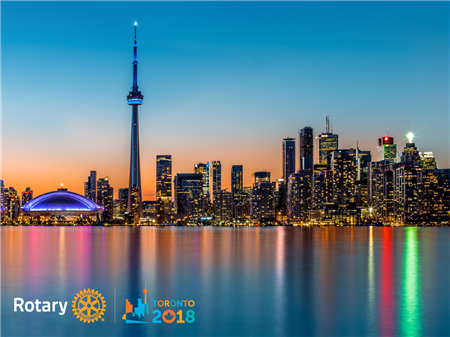 If you think there is more to learn, like what is Rotary's Manual of Procedure, or just how to learn more about Rotary and what other clubs do, read on. 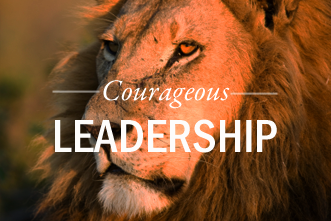 There are many resources to learn more about this great organization. Just attending meetings and talking to your fellow club members will give you a little bit of knowledge each week. But if you want to know more and faster, there are some ways to get to know more. Imagine having your newborn placed in a neo-natal intensive care unit. You and your family are traveling, or maybe you live nearby but can’t spend every waking hour in the hospital. How can you watch your baby’s progress and growth? 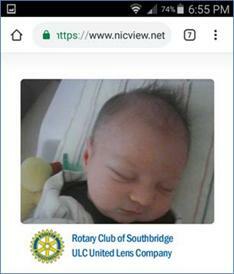 If your child is in the Neo-Natal Intensive Care Unit of the University of Massachusetts Memorial Children’s Medical Center in Worcester you are in luck — thanks to Rotarians throughout District 7910.
or the past few years, Rotary International has been promoting Reconnect Week as a time to remind Rotary clubs of the value of reaching out and “reconnecting” with alumni of Rotary programs like Interact, Rotaract, scholarships, Rotary Peace Fellowships, youth exchange and other regional programs. But celebrating alumni and making them feel welcome to your club is something you can and should do year-round. 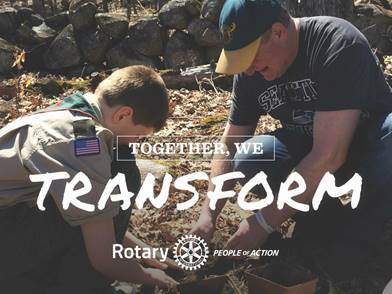 Alumni of Rotary make great leaders and innovators and may possess the skills you need for your next service project. 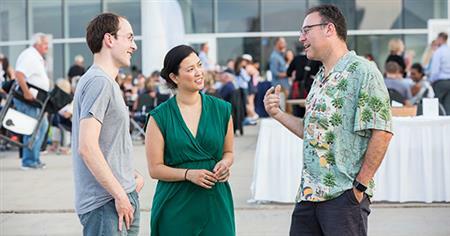 So in that spirit, we collected five events that impressed us during this year’s Reconnect Week in October to encourage you to think of ways you can reconnect with alumni in the new year. 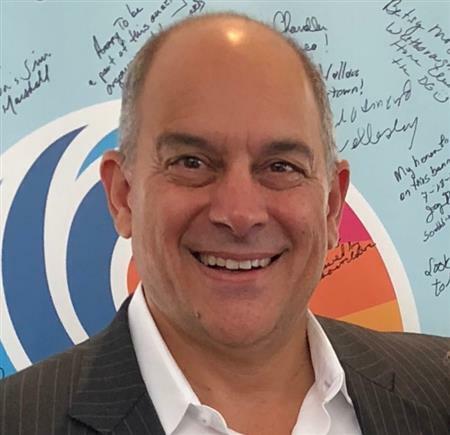 District Alumni Chair William Inniss of Cayman Islands has made it a tradition with his district’s alumni association to hold an annual video conference for Reconnect Week. Since his district is made of many islands, travel between them is more difficult for in-person meetings, so this is simply the best way to keep up. During the meeting, members of the alumni association discuss their past experiences and decide how best to partner with local Rotary clubs. We recently received an email from Camilla Vogt, the recipient of our District’s endowed Global Grant Morley scholarship. 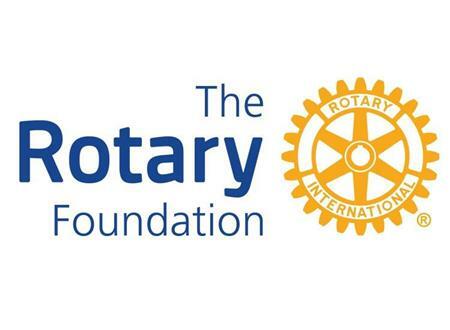 This scholarship provides funding for a year of foreign study pertaining to one or more of Rotary's Six Areas of Focus. Camilla, shown here writes "I hope your fall is going well! I can hardly believe it is almost November. My first month here has flown by. We are halfway through the academic term, and school is taking up a tremendous amount of time. I have already written three papers and have an economics test every week. I am trying my hand at rowing, which means early (and chilly!) mornings, and organizing a student speaker series at my department. Each day is rich and full, and I am loving it here so far!" 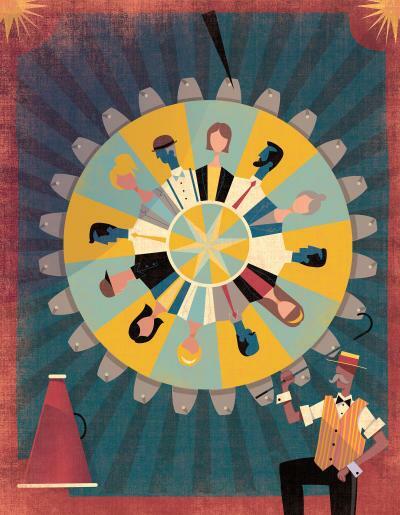 The Rotary Club of Langhorne, Pennsylvania meets for lunch at a restaurant in a historic mansion, but at times attendance was at risk of falling below the minimum 20 meals required by the venue. 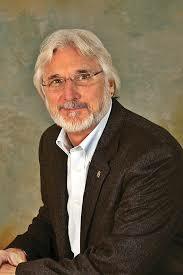 “We were losing members because they couldn’t make meetings,” recalls Club Membership Chair at the time, Bill Kaufmann. Board discussions yielded ideas but no firm solutions. Then one member started sending his office manager to meetings in his place. 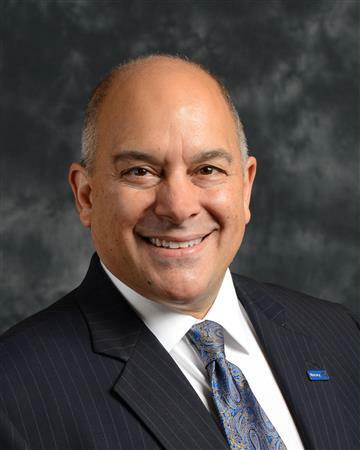 “That was my ‘aha’ moment,” says Kaufmann, now Club President. The Club then decided to let members designate a business associate or family member to attend meetings and participate in projects in their stead – or alongside them. 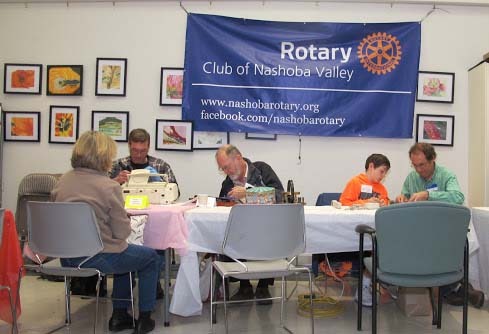 Westborough Rotarians Help Voter Access! ROLL TO THE POLLS! 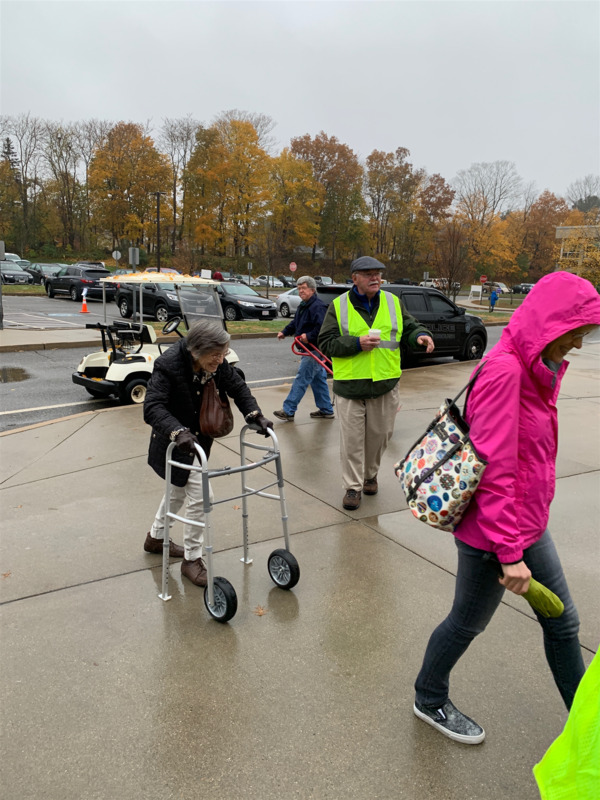 On Election Day (Tuesday, November 6th), the Rotary Club of Westborough helped voters access the polls at Westborough High School. 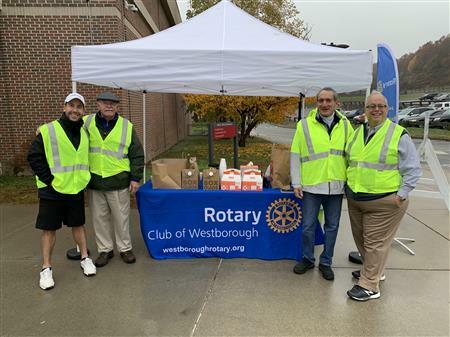 Rotarians, wearing brightly colored Rotary Club vests, helped with wheelchairs, golf carts and umbrellas from their cars to the High School entrance and to the gymnasium where the polls were located. 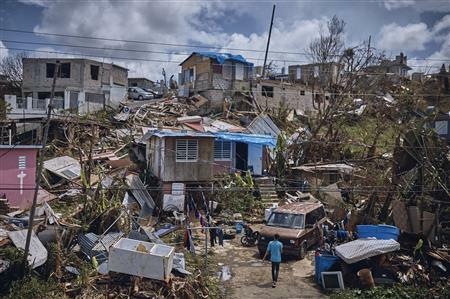 Upon exiting the polls voters were helped to return to their cars. The finishing touch…a pop-up tent to keep voters dry, donuts and free coffee and welcome smiles! This is the second time the club has hosted this event. 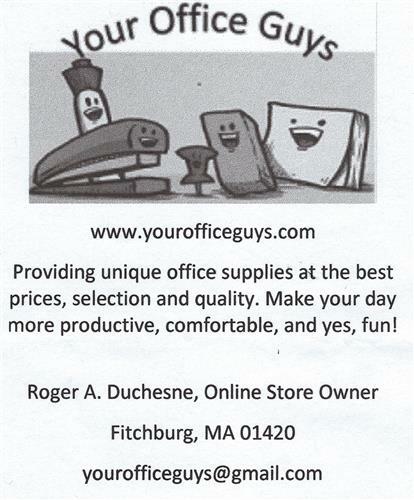 It’s a simple one, provides necessary service and offers great visibility. The Club is already in the planning stages for Roll to the Poll 2020! 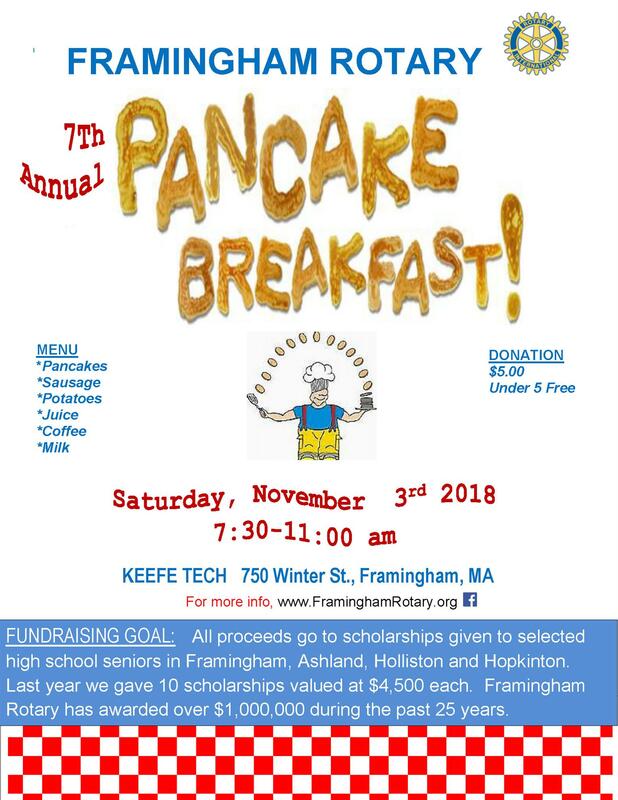 The Framingham Rotary Club of held its Annual Pancake Breakfast on November 3—it was the seventh in the series— at Keefe Tech High School’s East Room, which is the showpiece and training center of the school’s culinary and hospitality department. 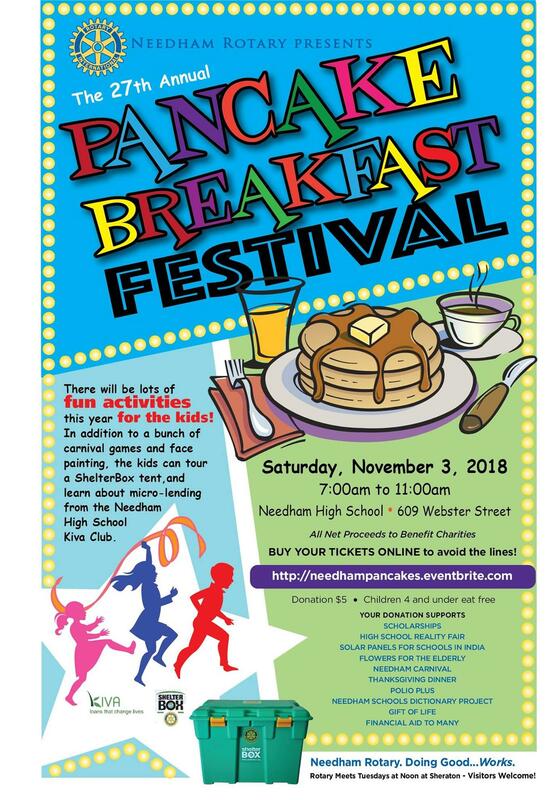 Some 300 guests, individuals and families from the City and adjacent towns enjoyed pancakes with genuine maple syrup, hash browns, sausages, juice, coffee, tea, and milk. 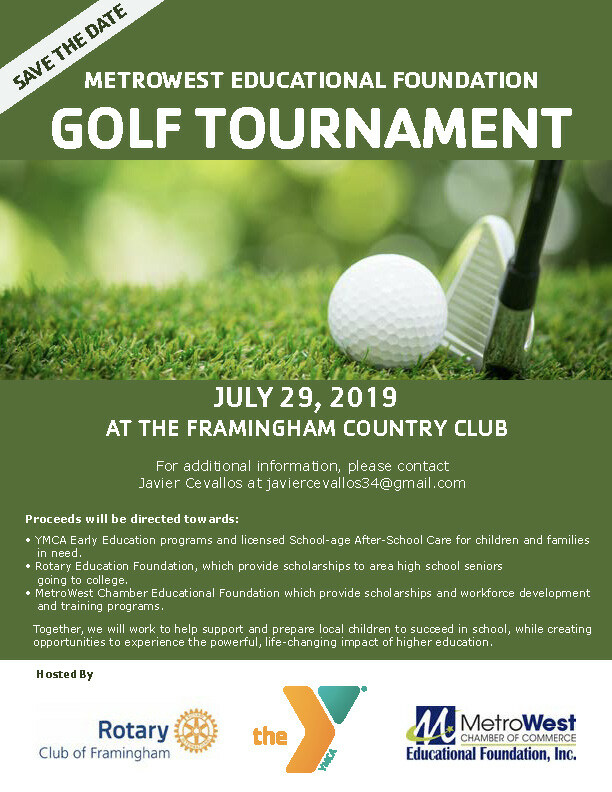 All of the proceeds will support scholarships to selected high school seniors in Framingham, Ashland, Holliston and Hopkinton. DEADLINE EXTENDED FOR Guatemala Stove Project Sign up! 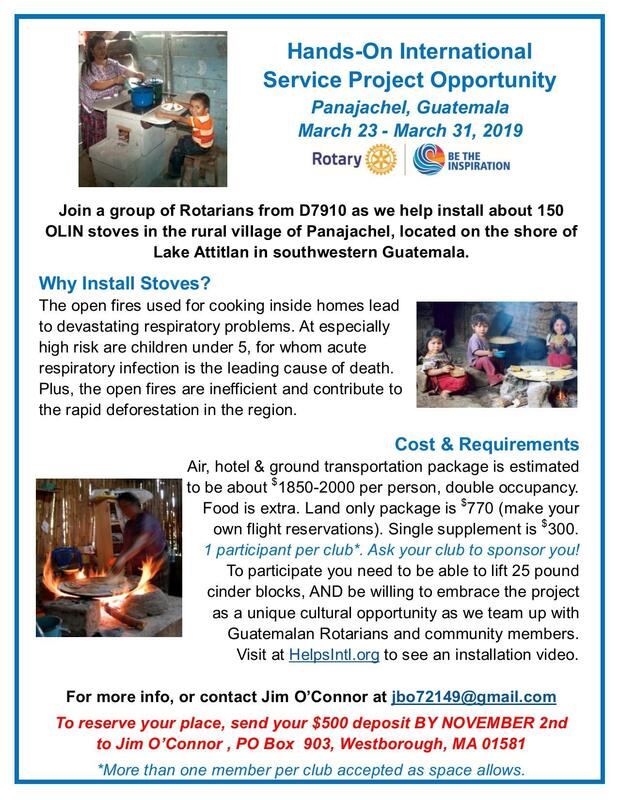 Please join Rotarians from Rotary District 7910 with our hands-on District Sponsored Global Grant Project installing stoves in the rural villages around Panajachel, Guatemala. 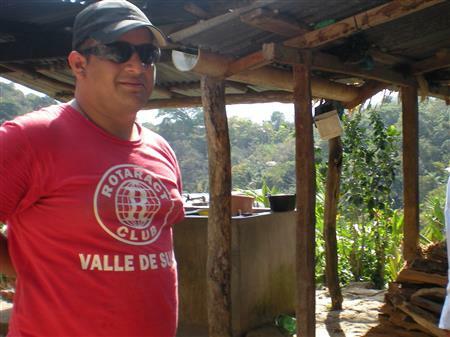 This International Service project is done in collaboration with several Guatemala Rotary Clubs. Are you a Rotarian interested in installing stoves in homes where currently an open fire in the center of the house is used for cooking. Cooking on an open fire in an unventilated area increases respiratory diseases and burn injuries, particularly with mothers and children. It also results in rapid deforestation as open fires are inefficient. These stoves will improve the ventilation in homes thereby decreasing the carbon monoxide, it will reduce injuries, and will decrease wood consumption by at least 50%. Southborough Rotary club members helped support the Southborough Library by volunteering at the Strawberry Festival organized & held by the Library at the end of June. In the 80’s, the Strawberry Festival was a popular town event, so the Library was keen to try and restart it – Festival 2.0! Club members helped serve strawberry shortcake & strawberries to the public. 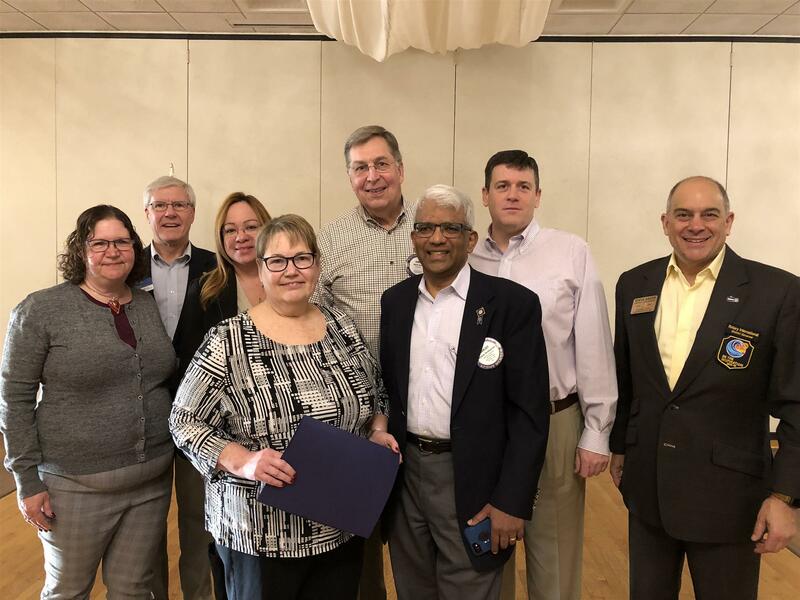 And since literacy is one of Rotary's key areas of focus, the club also decided to donate 2 raffle baskets of children’s books for the event. The children’s books were all on topics along Rotary ideals like: helping others, 1 person making a difference in the world, tolerance, resolution conflict, people working together for positive change. The Strawberry Festival also featured Coco's Tropical Ice, petting goats & veggie stamping for kids, as well as the big book sale inside the library. 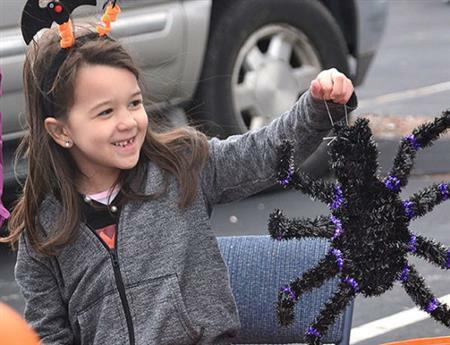 Over 200 people enjoyed the event and many said they hoped it would be held again next year. The club also produced the fun look back video which was given to the Library and Southborough Access Media after the event. The Sturbridge Rotary Club recently helped build a new outdoor playground at the Tri-Community YMCA Child Development Center, 115 Marcy Street in Southbridge. The new outdoor playground, built with the help of the Sturbridge Rotary Club, will be enjoyed by more than 150 kids a day. 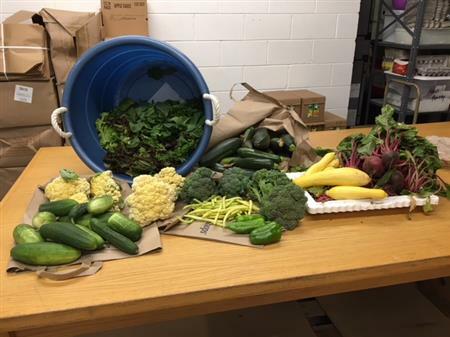 Has your club recently hosted a service project that you want to showcase to be the inspiration to other clubs? 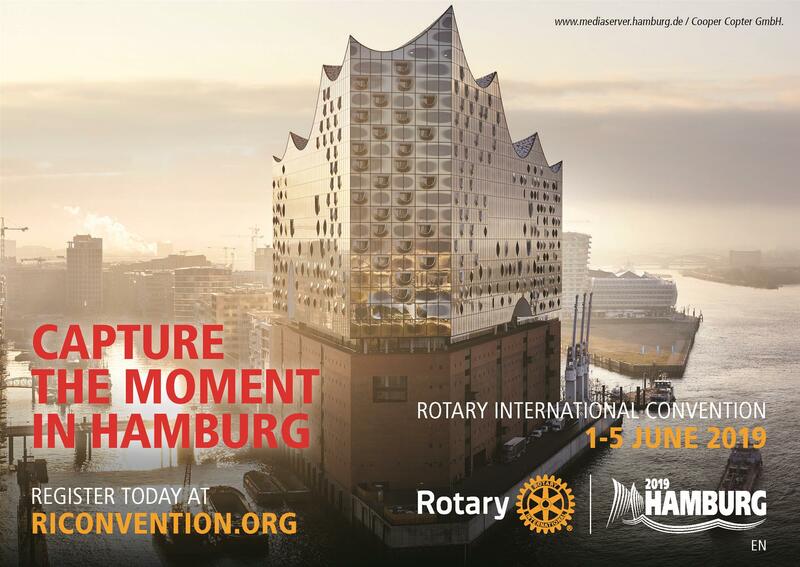 Are you planning something in the near future that you would like to share with your fellow District 7910 Rotarians? Our District 7910 eBulletin, Website, Facebook and Instagram depend on the content provided by our clubs, so please submit your stories and we will publish them on the district website, in the next eBulletin, and on social media. 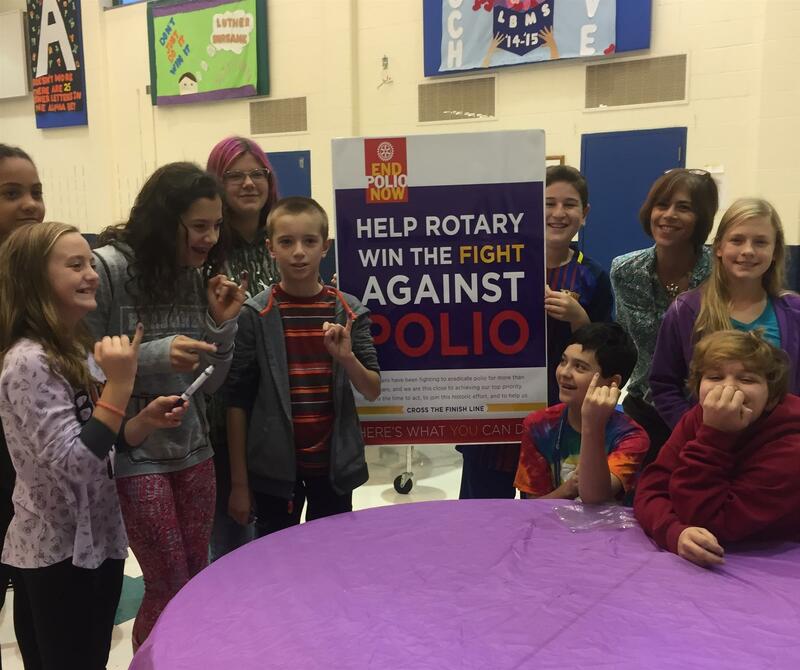 Stories that showcase your club's service projects should be submitted in plain text along with a photo. 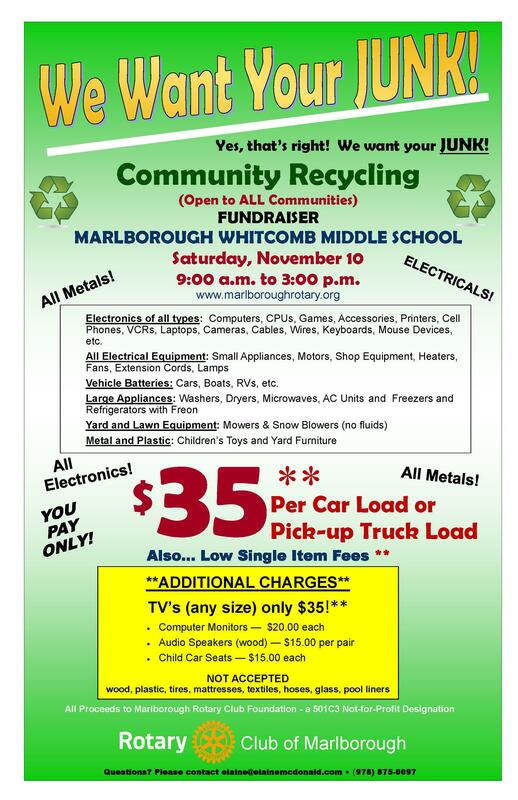 If you are promoting an event, please send the flyer along with a sentence with the details of the event. 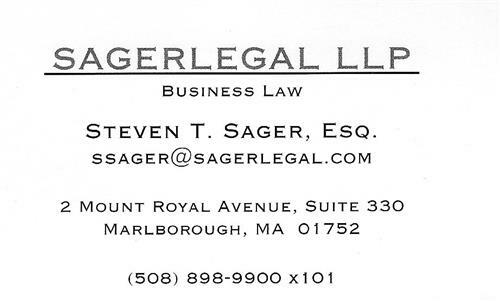 Please send your stories to ssager@sagerlegal.com with the words Rotary Story in the subject line. The District 7910 Membership Committee will meet on a quarterly basis (September 12, 2018; January 17, 2019; April 8, 2019) to discuss with Club Membership Chairs the best practices and success stories both outside and within the District and then how to share this information at the club level with the help of Area Membership Coordinators (AMCs). 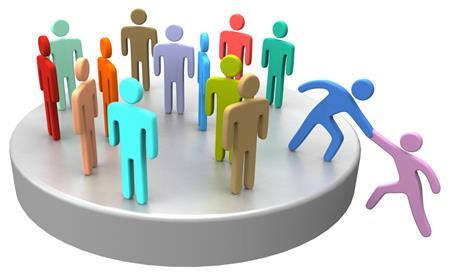 AMCs will coordinate with Assistant Governors and meet with Club Membership Chairs and Presidents on an individual or group basis to offer support in implementing membership attraction and engagement strategies in the clubs.